The Herb’n Market is back on campus! Your voices have been heard. 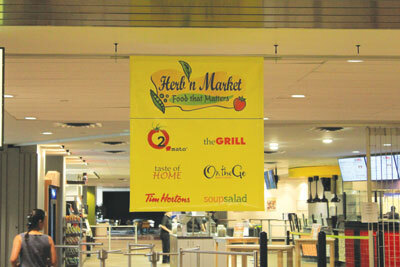 The new and improved Herb’n Market, which has been brought back to life by consultants at Kaizen Food Service Planning & Design, offers breakfast, burgers, pizza, soup and salad, a self-serve Tim Hortons and more. After the previous food provider, Sodexo, pulled out, Mount Royal’s Business & Retail Services department decided to close the Herb’n Market and take a gap year to determine whether or not to reopen. Chartwells, a new food provider, has taken over for Sodexo. Hungry students, don’t despair! The Herb’n Market is back with a huge line up of options to satisfy your appetite. Mike Reed, Associate Vice President, Business & Retail Services, Mount Royal University explains how the Herb’n Market was brought back. The decision by the project team to take the gap year, after the Herb’n Market was closed for not making money, was to ensure a successful venture. “Many of the concepts had gotten stale. It would have been easy to just polish up and reopen the old Herb’n Market, but that wouldn’t have met the needs of the University community,” Reed explained. Along with Mike Reed, the Herb’n Market project team are Jasmen Tustin and Curtis Haimila from Chartwells, Ricardo Piedrahita and Curtis Reed from MRU Physical Resources, Mei Lee from Business & Retail Services, and the summer intern Michelle Vaniersel, (The Reflector’s Layout Editor) and 4th year Information Design student. The team created a number of opportunities for students to voice their concerns through open houses, stakeholder interviews and focus groups which generated 1000 suggestions and ideas from students. With the new and improved Herb’n Market ready on the second floor of campus by the main gate, students can expect something familiar but with new options.